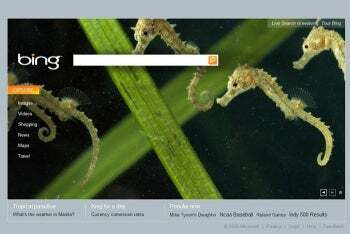 When the Bing search engine was unveiled on May 28, 2009, Microsoft hoped for an alternative -- if not an answer -- to the all-powerful, all-knowing Google. Now that Bing has passed into its first year, it's time to ask: where are you going, where have you been? Here's a glimpse of Bing's upbringing, evolution, and future. Rather than copying Google's nonexistent aesthetic, Microsoft released an eye-candy search engine with rotating high-resolution photographs. Bing also emphasized categories -- subdivisions such as Web, Maps, Images, and Health -- to parse through millions of pages in an organized fashion. And through technology acquired by Powerset, Bing attempts to figure out the searcher's intent rather than relying on matching keywords -- an effective way to ridding oneself of junk pages. Microsoft reportedly dumped $100 million into an advertising blitz for Bing. It also attempted to woo users by offering cash for searches. If a user clicked on a sponsored Bing link, Microsoft threw dough. The Cashback program was recently dismantled and Microsoft spun its failure as an "experiment" that did not garner a "broad adoption that [it] had hoped for." Cashback dies on July 30, 2010. So how does Bing fare in the Search Engine Coliseum? Pretty well. Depending on your source, Bing is either gaining steam or losing it. Bing has settled into a roughly 9 percent market share, positioning it in third place, according to Hitwise. Google, meanwhile, has gobbled over 70 percent of the search engine market share. But keep a close eye on Bing: since acquiring Yahoo Search, Microsoft stands to sop up almost three times the search queries it's getting now. The number two spot isn't far away. Bing's relationship with Apple improves as the days go on. Ever since Apple and Google started their row, Microsoft has benefitted from the fallout. The Bing iPhone app is a step in the right direction, and though Bing will not become the iPhone's default search engine, upon the release of iOS 4.0 and the iPhone 4, Bing will become an option for the Safari Web browser. This could definitely increase Microsoft's market share. The future of Bing is uncertain. Over the past year it has seen its share of pratfalls, gains, and accomplishments -- but the search engine battlefield is a tough one. Try as they might, it doesn't seem that anybody will ever come within arm's length of Google. Yahoo and Apple could boost Bing's awareness, but let's face it: Google is a verb.